About eight or nine years ago when I was still the pastor of St. Benedict’s in Kenwood, I had a subscription to a magazine called, Inside the Vatican. It was just as it sounded, a monthly telling of all the “goings on” behind the scenes at the Vatican. I was always more interested in the pictures than the articles, which seemed somewhat dated. I remember one picture of an older gentleman wearing a Swiss Guard uniform. He was a former member of the Guard who happened to live in Wisconsin. Then, as now, I had this strange addiction to all things papal, so I tried to track him down. I can’t remember all that happened, but I remember talking to his son for sure. I maybe even called the former guard himself, but it came to nothing, and I quickly forgot about it. A couple weeks ago, I had a hard time falling asleep, and for some reason this old Swiss Guard popped in my head again, and because I remembered his name I once again tried to track him down. This time I had great success!! 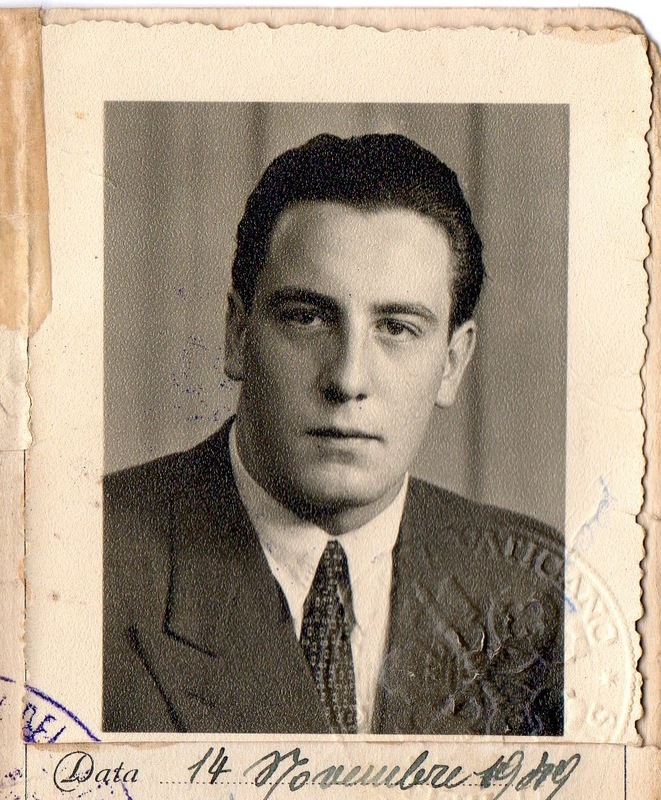 We spoke on the phone a few times, and it turned out that he was a Swiss Guard under Pope Pius XII, from 1949-1951. After his telling me many great stories from his time in the Guard I inquired if he would consider donating his uniform to my collection, and he said, yes!! I am very excited about this as I have tried to get one of the “modern” guard uniforms for years, but they are nearly impossible to acquire. 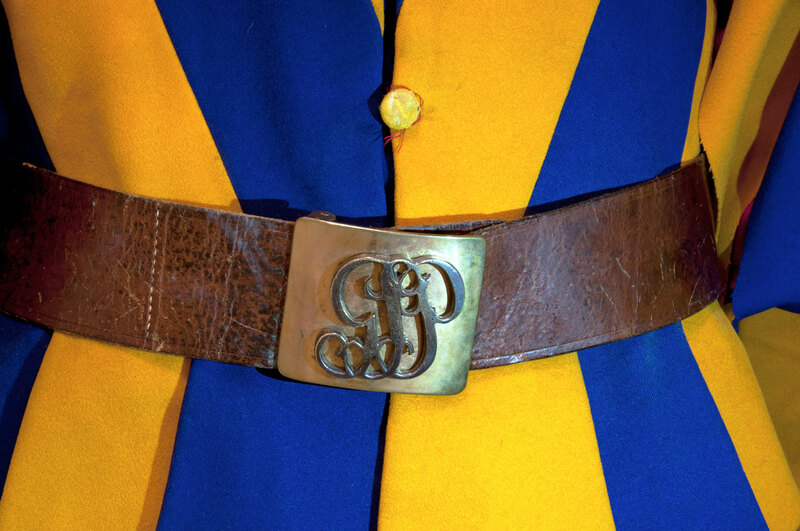 The modern Swiss Guard uniform is the same exact model of the original uniforms in the early 1500’s. Over time and up until 1914 the uniform evolved, but in 1914 they went back to the original design, which is exactly what you will see if you go to the Vatican today. 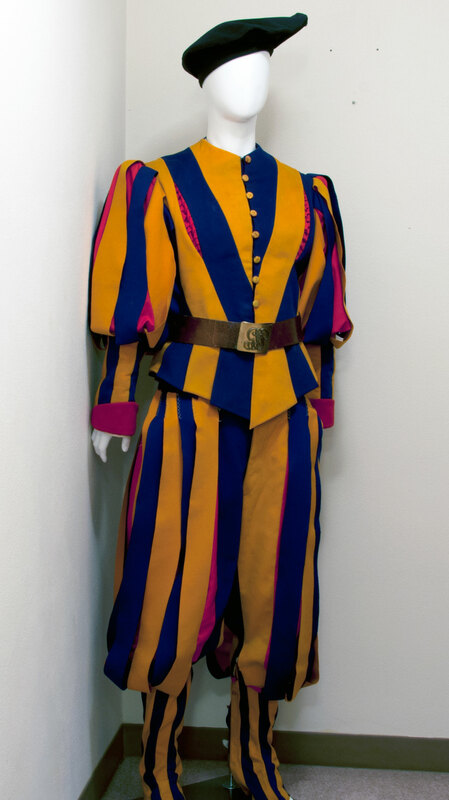 In my papal collection I have two guard uniforms that pre-date 1914, but not one of the new ones. Recently I traveled to southern Wisconsin to meet the former guard and to pick up his uniform! It was a great visit, and over dinner, I recorded a conversation between the two of us. He told me many great stories connected to his time at the Vatican. He also shared several photos from that time, as well as the program from his swearing-in ceremony on May 6, 1950 and his Vatican ID. I am indebted to Mr. Paul Good for his generosity. This is an incredible addition to the Papal Artifacts’ Collection.